Thousands of people clogged downtown Springfield on June 30, 1939, celebrating the fact that streetcar tracks no longer crisscrossed Monroe Street. 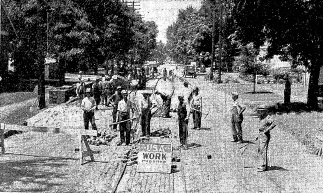 The giant festival, which included three bands, a jitterbug contest and appearances by city officials, was the climax of the city’s effort to tear up streetcar tracks throughout much of downtown Springfield. Much of the financing for the track removal came from the federal Works Progress Administration, one of the “alphabet soup agencies” initiated by President Franklin D. Roosevelt to battle the Great Depression. But track removal was only one of many projects that remade the geography of Springfield and Sangamon County in the 1930s. 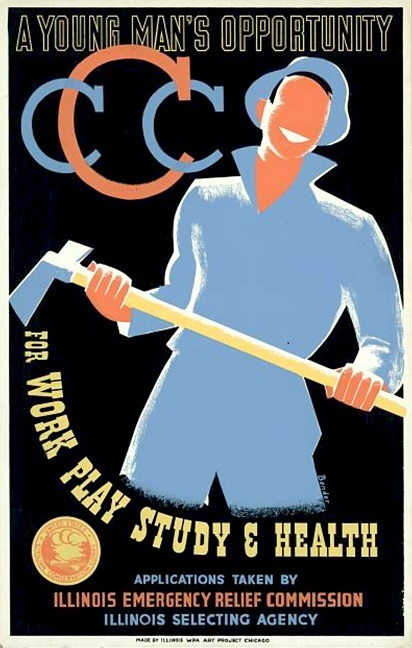 Besides the WPA, related agencies included the WPA’s predecessor, the Civil Works Administration; the Public Works Administration, which paid private contractors to take on large-scale projects; and the Civilian Conservation Corps, which hired unskilled young men for a variety of nature-related endeavors. 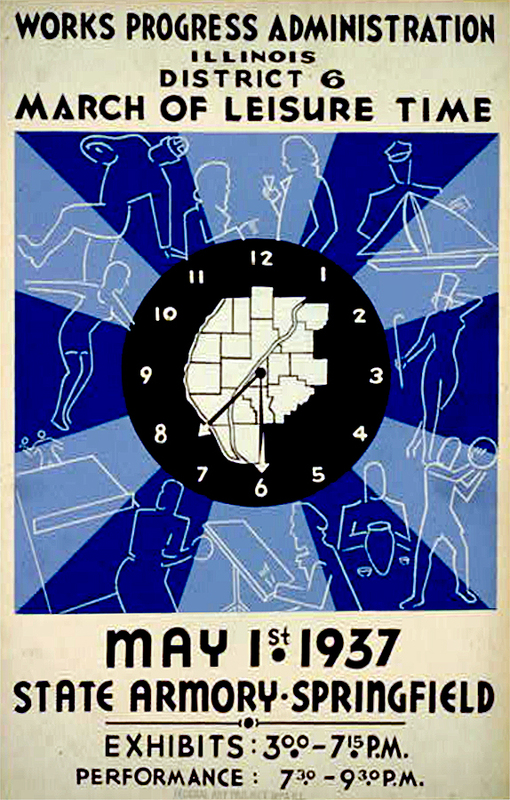 Among local initiatives that benefited from Roosevelt’s relief programs were the creation of Lake Springfield, construction of the state Armory and Archives buildings, and the conversion of Reservoir Park to the site of Lanphier High School. The Illinois State Fairgrounds got new structures via the WPA, and a WPA offshoot even began cataloguing documents related to Abraham Lincoln’s law career, building a foundation for the later Lincoln Legal Papers program. 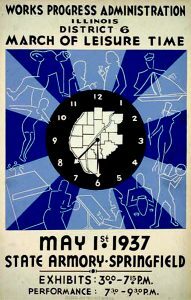 Created in the spring of 1935, the WPA (later renamed the Work Projects Administration) relied on unskilled labor for most of its projects. The WPA built sidewalks, roads, park pavilions, recreational spaces and post offices across the nation. Beyond infrastructure, the WPA hired citizens in the arts and academics to create plays and handicrafts, write music, paint murals and archive historical documents. Hugh Dobbs, city corporation consul under Springfield’s Depression-era mayor, John “Buddy”Kapp, told The State Journal-Register in a 1978 interview how Springfield was on the forefront of collecting assistance from the WPA. 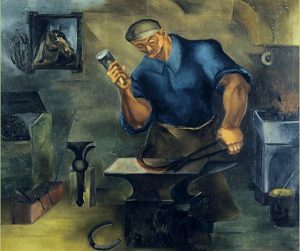 “The Blacksmith” by Leon Garland was done for the WPA; the painting now is part of the art collection at the Illinois State Museum. ministration, and he and city Finance Com. Harold Luers traveled frequently to Washington, D.C. to lobby for funds to either start or complete local public improvements. The city submitted a $3 million list of infrastructure projects to the federal government in May 1933, just two months after FDR took office. Officials said the list, which sought funding for projects like sewer lines, electrical work and road widening, would employ 1,000 men. Camp Lincoln, 225; Peoria band work, 8; public health survey, 94; spreading of oil mats on Springfield’s unpaved streets, 93; county highway improvements near Springfield, 31; repairs at county courthouse, 8; improvements at Oak Ridge cemetery, 39; grading Springfield alleys, 93; Riverton street repairs, 71; Salisbury road work, 10; Chatham improvements, 53; Williamsville improvements, 76; Lowder improvements, 27; Pawnee improvements, 41; Auburn improvements, 53; removal of reservoir mound in Lanphier park, 99; construction of beach and beach house at Lake Springfield for colored persons, 14; Cooper township improvements, 20. “(C)ommon labor will be done by colored workmen” at the new beach (later to be known as Bridgeview Beach), the story noted. Removal of the streetcar tracks, which went on in 1938 and 1939, was viewed as a step toward modernization, convenience and safety. The old tracks ran down the middle of streets and obstructed traffic, creating hazards for riders and pedestrians. The resulting scrap iron was sold to the Japanese government, which used it to build up armaments for World War II a few years later. Proceeds from the sale allowed the city to do even more street improvement projects. Even the Springfield Transportation Company, whose track system was being removed, got in on the act. In a newspaper ad, the company touted how city bus service would “always be available”. At Lake Springfield, federal work programs supplemented local funds to help dig the lake, build the lake beach house and city’s new power plant. The water filtration works at the lake was a PWA project, while WPA laborers played a major role in construction of the Girl Scouts’ Camp Widjiwagen. The 1938 Illinois State Fair boasted several new buildings, whose $800,000 cost was paid for by a combination of state and WPA funds. Those buildings were the Junior Livestock Building; the Junior Home Economics Building and dormitories; a judging pavilion erected between the sheep and swine pavilions; and the Visitors Service Building, which housed state police, a fire station, a drug store, a first aid center, a post office and another dormitory. The Illinois State Armory, built in 1936-37 to replace the old State Arsenal, which had been destroyed in an arson fire in 1934, was initially earmarked as a WPA project. However, the request did not coincide with WPA funding schedules, Illinois officials re-directed the project to the PWA. The first event held there was the second-term inaugural of Gov. Henry Horner. Developed with PWA assistance in tandem with the Armory was the Illinois State Archives, today the Margaret Cross Norton Building. That structure, dedicated in June 1937, enabled hundreds of thousands of historical documents and photographs to be housed in a single 140,000-cubic-foot fireproof location with easy public access. At the time, the new building was larger than the National Archives in Washington, D.C. The PWA also supported a waterworks project between Lake Springfield and the communities of Auburn, Chatham, Divernon, Girard, and Pawnee. The Chatham Recreation Center and an addition to the old Ball Township High School were built through the PWA. In the summer of 1935, CCC crews worked in the thickly forested grounds of Carpenter Park, north of Springfield, to install water service and create a campsite for the Girl Scouts. 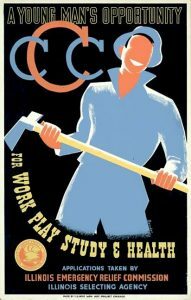 Newspaper accounts reported 250 workers enrolled in local CCC activities that fall. Young men of the CCC wore a distinctive dark green, forestry ranger-style military uniform. In addition to conservation, the CCC built furniture and fireplaces and performed landscaping. According to a 2009 State Journal-Register article, the CCC maintained at least four area camps. Inside Sangamon County, workers were housed in a barracks at Camp Lincoln beginning in 1933 and then transferred to Cotton Hill Township, near Lake Springfield, to work on lake-based projects. Outside the county, a CCC camp was established south of Petersburg in 1934; young men there helped reconstruct New Salem Village. Other camps were west of Jacksonville and south of Carlinville. The WPA began vocational training, in anticipation of a change over to war-related industrial work, as early as 1940, but the agency was shut down shortly after the war began. Large-scale layoffs resulted, and some were abrupt – 127 WPA laborers working on repairs along Walnut Street, for instance, were laid off en masse. Critics of the New Deal and its approximately 60 programs complained that the federal government had become bloated under Roosevelt. Some of the relief projects were mere “make-work” programs, they said. 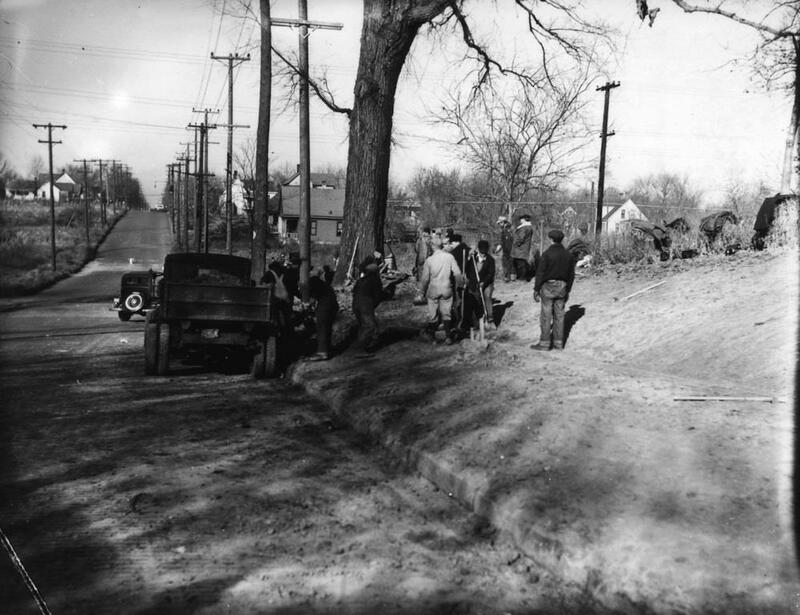 For example, removal of the reservoir mound in Lanphier Park took months and involved hundreds of unskilled laborers, apparently working with little more than shovels and wheelbarrows. By the spring of 1936, the cost had amounted to more than $38,000 with two-thirds of the mound still standing, the Journal reported. “Private engineers have estimated that a private group, equipped with a steam shovel and ten trucks, could clear the mound away in forty working days at a cost of about $8,000,” the newspaper said. But FDR had the final say. When dismantling the WPA, he touted it as the best solution his administration could offer during the long economic hardship that had engulfed the nation. Roosevelt could boast that an estimated 8 million people were put to work during the Depression, supporting some 30 million dependents. “Useful work is superior to any kind of dole,” the President concluded. This entry was posted in Arts and letters, Buildings, Celebrations, Depression, Local government, Social services, Transportation. Bookmark the permalink. Awesome article! My dad worked for the WPA and it helped many during the Depression.